A female carpenter (such an interesting twist! )...a vengeful and abusive ex-boyfriend...and the love of a lifetime. Can Nila and Will find a way to forever, or will evil and past pain shatter their dreams? Can forgiveness and redemption sing their song within two hearts scarred by fear and feelings of unworthiness? 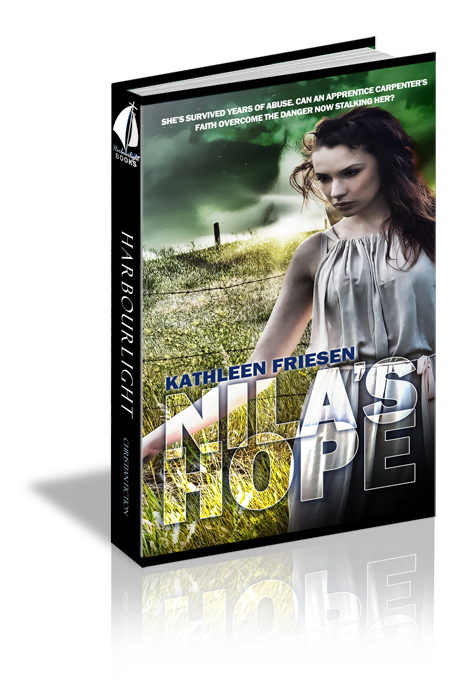 With a gift for page-turning suspense, heart-wrenching personal conflict and an exquisite writing voice, Kathleen Friesen hits all the right notes with her Harbourlight release, Nila's Hope. I look forward to her next release! Disclaimer: I was given a PDF copy of this book in exchange for an honest review.